Where to Ski in Morzine? Morzine and the surrounding Portes du Soleil ski area is vast, with a whole variety of skiable terrain waiting to be explored. From well-groomed pistes, to tree lined runs and steep mogul fields, there’s plenty of skiing in Morzine to enjoy on your ski holiday with Simply Morzine. The elements can affect your skiing and different areas in Morzine can be more suitable or enjoyable in varying weather or snow conditions. Here’s a brief Simply Morzine guide to help you ski in the most suitable area. Beginners – The Morzine – Les Gets ski area has plenty of beginner-friendly green and blue runs. Ski lessons usually start at the top of the Morzine Pleney telecabine, where there’s a magic carpet for complete beginners to skiing. Intermediates – The Rainfolly bowl in Les Gets offers plenty of long, wide red and blue runs, all of which are ideal for cruising. Alternatively, the Nyon and Chamossiere areas in Morzine have both red and black routes that present more challenging skiing options. Advanced – Using the full Portes du Soleil ski pass, Morzine skiers can access a diverse array of pistes that will keep even the most experienced skiers occupied. There are black runs in Mont Chery, Grand Combes, and the most challenging of all, the infamous Swiss wall (Chavanette). 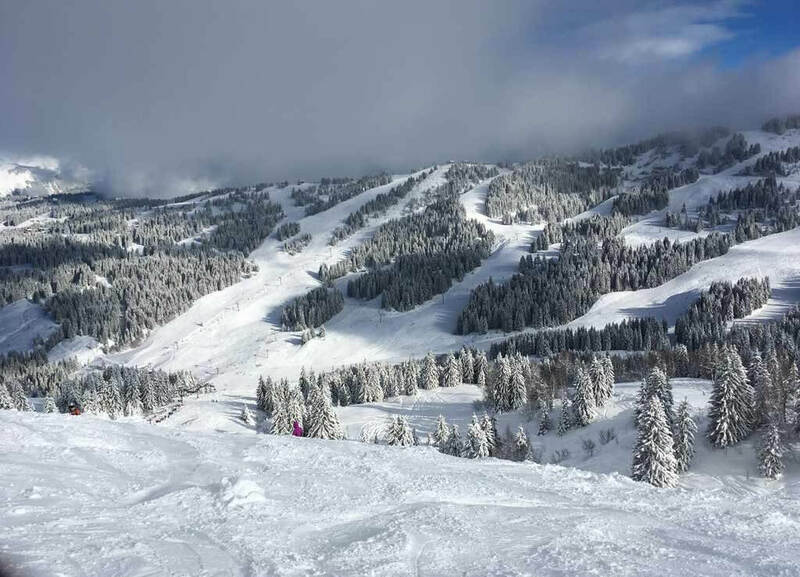 Skiing in Morzine in snow or poor visibility – In poor visibility it is advisable to stay lower and in particular, ski in tree lined areas of Morzine. This gives good cover and the forests provide visual reference points. Most of the Morzine – Les Gets ski sector meets this criteria. In Avoriaz, the Lindarets bowl has several tree lined blue runs that are great fun to ski in fresh powder. Skiing in Morzine in windy conditions – In high winds the higher chairlifts can be closed, so it is best to ski in more sheltered areas around the forested bowls of Morzine and Les Gets. It is possible to ski a full circuit of the Portes du Soleil area, starting and finishing in Morzine. There are several routes and variations, however based on our knowledge and experience of skiing in Morzine, we recommend the anti-clockwise circuit via Mossettes, Crosets, Morgins, Chatel and Lindarets. Morzine and the Portes du Soleil lay claim to some of the finest and most varied skiing in the world. Morzine makes the perfect ski holiday destination for people of all ages and abilities and it is waiting to be explored. We look forward to welcoming you to Morzine! Simply Morzine offer on-piste and/or centrally-located winter accommodation at the heart of Europe's largest ski & snowboard area. Properties include high-quality catered chalets, self-catered chalets & apartments and a French hotel. We specialise in flexible midweek breaks and long ski weekends at our centrally-located and/or on piste ski accommodation in Morzine & Les Gets, French Alps.